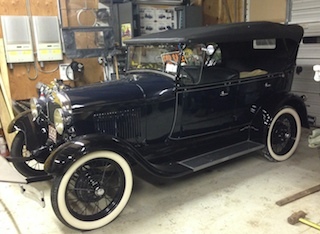 Jersey Carts Builds Electric-Powered 1929 Ford Model A for Broadway Stage! 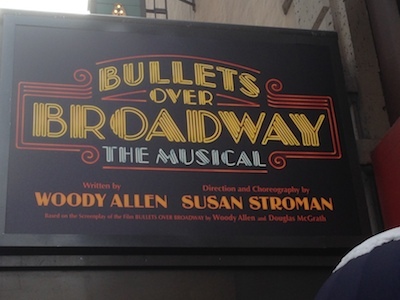 Our latest project for the entertainment industry was an exciting challenge: build a zero-emissions, fully functional, battery-powered Model A Ford Phaeton for extended use on stage in New York City's St. James Theatre during an upcoming run of Woody Allen's Bullets Over Broadway. An ideal challenge for the guys at Jersey Carts! Greg at Jersey Carts tells the story: "The original concept was to use a custom golf cart chassis, fitted with a Model A replica body kit but discussions with the propmaster (Pete Sarafin) revealed that the vehicle would have to be large enough to carry three adults, one of which was well over six feet tall. 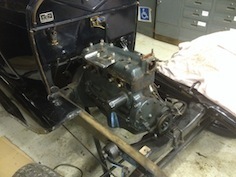 Even a modified golf cart chassis would be too small and we were sure the proportions wouldn't be right. 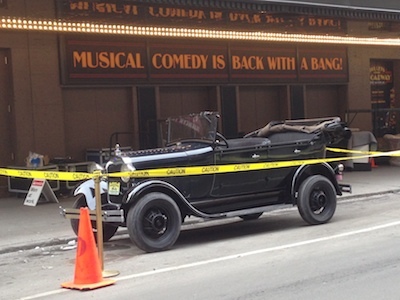 Considering the level of care that was going into set design so far, we knew that a 'real' car would be needed." Jersey Carts worked with the Bullets team to source a donor car and the car pictured above was purchased and shipped to our facility in December of 2013. With the car ready to operate, we invited Pete over for a short test drive. 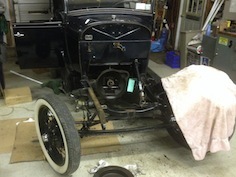 He was pleased; the car performed beautifully and the project was on-schedule. 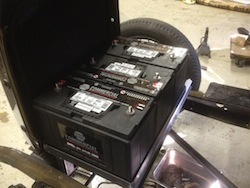 While we were very happy to have an operational car, much work was still needed. The seating area needed to be modified to accept the 6' 5" frame of the actor (Nick Cordero). 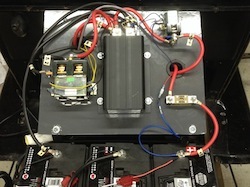 A dash panel needed to be constructed, with controls for propulsion and lighting. 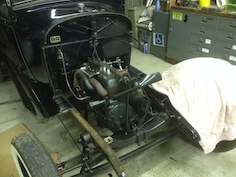 The vehicle was too wide to fit into the theater, so the fenders and running boards were sent out for shortenting and we shortened the axles, which narrowed the track of the car. 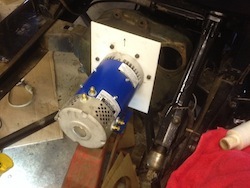 Likewise, the bumpers needed to be shortened, with relocated mounts. A smaller steering wheel was even required, as Nick's legs were simply too long to allow easy ingress and egress with the original wheel!